MOSCOW, Russia -- Russia on Sunday accused Ukraine of lobbing a shell over the border and killing a Russian civilian and warned of “irreversible consequences,” in a sharp escalation of rhetoric that raised fears of a Russian invasion in Ukraine’s east. 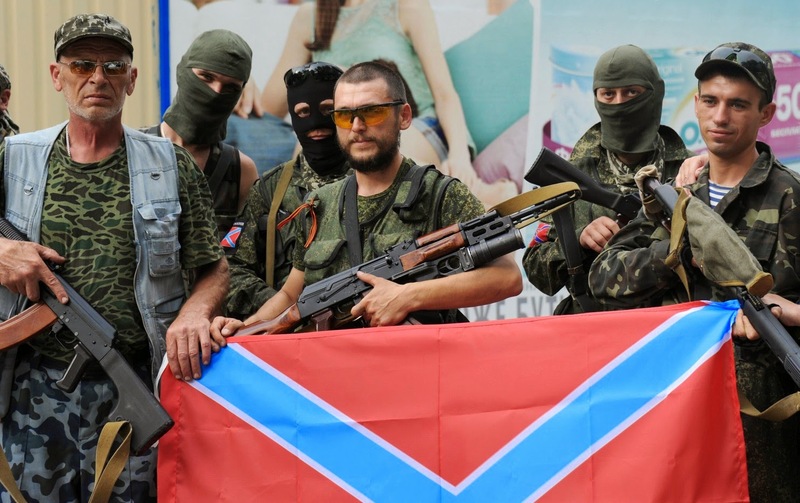 Pro-Russia militants pose with the new Russia flag in Donetsk, eastern Ukraine. Ukrainian security officials, meanwhile, said that about 100 military vehicles driven by “mercenaries” had attempted to cross the border from Russia early Sunday, and that Ukraine’s military had destroyed some of the vehicles. Russian officials summoned the Ukrainian charge d’affaires to the Foreign Ministry in Moscow to protest the civilian’s death. The Russians say it occurred when the Ukrainian army shelled Russia’s Rostov region, hitting a residential building. Two other people were injured, authorities said. “We need to use precision weapons, like Israel’s, to destroy those who launched the bomb,” the deputy speaker of Russia’s upper house of parliament, Yevgeny Bushmin, told the state-run RIA Novosti news service. Ukrainian and Western officials have accused Russia of offering quiet support to the rebels, a charge that rebels themselves appeared to confirm this past week, although the extent of the aid is unclear. Ukrainian officials denied that they fired onto Russian soil, saying that the attack may have been the work of provocateurs seeking to draw a Russian reaction. “Forces of the anti-terrorist mission are not firing on the territory of a neighboring country,” Andriy Lysenko, a spokesman for Ukraine’s National Security and Defense Council, told a news conference in Kiev on Sunday. But he told journalists that there had been shelling in the area early Sunday coming from both rebel and Ukrainian army positions. Pro-Russian separatists made a “massive artillery strike” on Ukrainian military forces in Luhansk, just across the border checkpoint from where the shelling death is alleged to have taken place, he said. Once the column of vehicles was discovered, Ukrainian artillery positions fired on them, he said. Ukrainian officials said they were still working to determine further details about the incident. It was not immediately possible to confirm either side’s account, and Ukrainian officials did not have an explanation for why, in the fog of war, they could be certain that a stray shell had not hit the Russian side. Russian officials also offered no evidence that the shell was indeed of Ukrainian military provenance. The Ukrainian Foreign Ministry said Sunday that the country was “ready to cooperate” in any Russian investigation of the incident, and in a statement it “expressed regret at the deaths and injuries” of the Russian citizens. But the Russian warnings of consequences for the reported shelling raised tensions. Ukrainian television channels, including Channel 5, which is owned by President Petro Poroshenko, repeatedly played videos of tanks flying Russian flags rolling through what they said was easternmost Ukraine early Sunday. Many Ukrainians on social networks noted darkly that when Russian troops rolled into Georgia in August 2008, Vladimir Putin, then Russia’s prime minister, was in Beijing for the opening ceremonies of the Summer Olympics; Putin, now president, was in Rio de Janeiro on Sunday for the World Cup final. Poroshenko late Sunday urged the European Union to investigate what he said was a border incursion by “heavy military equipment” and attacks from Russian military positions on Ukrainian troop positions, his office said in a statement. Since pro-Russian separatists started seizing territory in April, Ukraine has struggled to maintain control of its porous border, and separatists have taken over several border checkpoints. Ukrainian officials say that the Russian government has tolerated the passage of a steady stream of military equipment and volunteers to assist the separatists’ fight, a charge that Russia has denied. Russia has been registering increasingly strong complaints that its border crossings and territory are being shelled from the Ukrainian side, although Sunday was the first time that it said that anyone had died as a result. Putin on Sunday said that “incidents where shells reach Russian territory, leading to today’s tragedy in the Rostov region, are unacceptable,” Kremlin spokesman Dmitry Peskov told reporters in Rio de Janeiro on Sunday after the Russian leader met with German Chancellor Angela Merkel, the Interfax news agency reported. Putin called for a return to the negotiating table to find a settlement in a format that includes the rebels, Peskov said. Negotiators met twice last month during a cease-fire that later lapsed amid charges of violations on both sides. 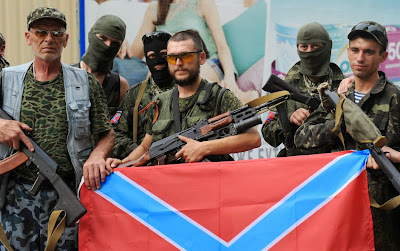 The rebels made a significant retreat on July 5, pulling back from the cities of Slovyansk and Kramatorsk and fortifying themselves inside the far larger city of Donetsk. Since then, fierce fighting has taken place in Ukraine’s east. On Sunday, Ukrainian government forces were engaged in a major assault on the rebel-held eastern city of Luhansk, and separatist officials said that the military appeared to be gaining territory. “They have lost their limits,” said a Donetsk rebel leader, Igor Girkin, also known as Igor Strelkov, in an interview with the Russian LifeNews television channel. Russia has not openly responded to direct appeals for aid from the rebels since the retreat. He called for “an immediate end to the bloodshed” in Ukraine. Go-o Ukraine, Go-o Ukraine, Go-o Ukraine. Push firm.